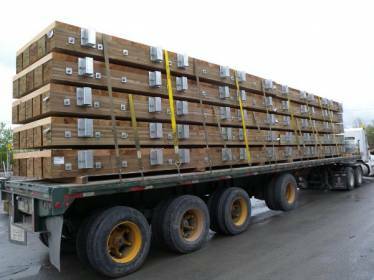 Portland Bolt‘s ability to economically and quickly manufacture threaded rods all within our own facility allows us to be a competitive and responsive source for rods used in the construction of large wooden mats. These mats, commonly referred to as crane mats, are used to create temporary bases for equipment to sit upon on jobsites where creating a foundation is too costly, impossible or when the equipment will only be used in the spot temporarily. In April of 2011 Portland Bolt supply over a thousand 1″ diameter, 74″ long galvanized rods as well as almost two thousand 3⁄4” diameter, 15″ long rods, along with other plates and standard bolts. All of the rods were made on an accelerated lead time in about 11⁄2 weeks in our facility in Portland, Oregon and shipped to a customer located in eastern Canada. (Shipping to all regions in Canada, as well as the rest of North America, is commonplace for Portland Bolt). Portland Bolt’s diverse manufacturing capabilities, including shearing, roll threading and our own hot-dip galvanizing facility allow us to be the perfect fit for this job and many other crane mat jobs. Portland Bolt’s hot-dip galvanizing line not only allows for a quality nut fit, but it also allows Portland Bolt to reliably accelerate our lead times, per our customers’ needs. Please consider Portland Bolt as a source for crane mat rods, galvanized rods and other nonstandard fasteners.